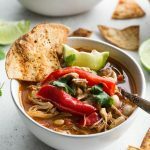 Chicken Fajita Soup has all the spicy flavours of a fajita, served up in a warming bowl of soup. It’s easy and clean eating, perfect for meal prep, and loaded with extra fibre thanks to the white beans! In a small dish, combine all the spices for the fajita seasoning. Add one tablespoon of oil to an oven safe pot/pan with a lid (I used a dutch oven) and heat over medium-heat on the stove top for a few minutes. Add the chicken to a bowl, and coat with the remaining oil and half the fajita seasoning. Add the chicken to the pot/pan, and sear on each side for 4 minutes. Once seared, add 3-4 tablespoons of broth to the chicken, enough to cover the bottom of the pot. Cover and bake in the pre-heated oven for 25-30 minutes, or until the chicken is cooked through. Remove from oven, and transfer chicken to a bowl, leaving juices in the pot/pan. Shred chicken with a fork and set aside. Add the pepper, onion and remaining fajita seasoning to the pot/pan, and sauté over medium heat on the stove top for 5 minutes. Add the shredded chicken, remaining broth, tomatoes and beans to the pot/pan and stir to combine. Cover and bring to a boil. Reduce heat and let simmer for a few minutes, or until the soup is heated through. Serve immediately with garnishes of your choice, or refrigerate for later. Be careful not to over-cook the soup as the peppers and onions will get too soft. You can use regular or reduced-sodium broth, tomatoes and beans, just note that the soup will be a little more salty. Instead of white beans, you can use black beans or red kidney beans. To make this soup more like a stew, just use less broth and/or add more chicken, veggies and beans. This recipe was inspired by Clean Eating Magazine’s recipe for Chicken Fajita Stew.